When a young Ben Thompson posed for a photograph with Millwall striker Neil Harris, and grabbed an autograph from the club's record goalscorer, little did he think their paths would cross again at The Den. Several years on and having come through the club's academy, the 20-year-old midfielder is a regular for the Lions, who are now managed by Harris. Thompson helped the side to four wins in April, which secured Millwall a place in the League One play-offs and has seen the midfielder named the Football League's young player of the month. "I have been watching Millwall since I was a little boy. My dad has been taking me since I was about four," Thompson told BBC Radio London. "I remember going down to ask Neil for a photo and an autograph. I've still got it at home. He hasn't seen it but he knows it happened. It was a great time for me." After making his first-team debut as a substitute in the League Cup last season, Thompson has established himself in the Millwall first team this term and has made 33 appearances in all competitions, scoring twice. "At the start of the season I wasn't in the team much but to get in there and express what I am about, it has all paid off," he said. "It has all been a bit of a blur and I haven't really thought about it too much. It is an unbelievable feeling to be awarded such a prestigious award." Millwall were relegated from the Championship last season after five years in the second tier, but they have a chance to secure an immediate return via the play-offs. "As a supporter, seeing the team doing well is a great feeling," Thompson added. "Last year wasn't the best for the club but this year we have pushed on a lot and become a good team. The finish to the season has been great and to get in the play-offs has been a massive achievement." 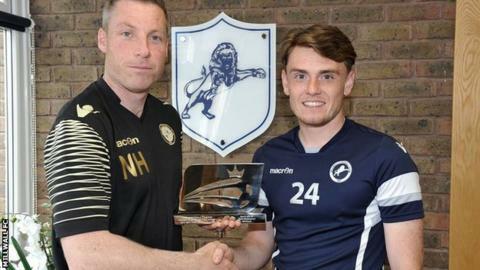 Millwall boss Neil Harris describes Thompson as "an excellent professional"
Harris, who led the Lions to a fourth-placed finish, says Thompson has "come a long way in a short space of time" since his league debut in August. "He plays with a spirit which epitomises our club," the 38-year-old said. "He plays like a fan in a football shirt, but one with real quality. He has been a big part in driving us forward in the last few months. "I am extremely proud of him and I'm sure he'd be the first thank his team-mates for putting him in a position to win this trophy. "Ben is an excellent professional at a young age and he is enhancing his game all the time." Thompson was in the stands as Millwall lost the FA Cup final in 2004, and has also watched the Lions in several play-off campaigns - including their win over Swindon which secured promotion to the Championship in 2010. Former Australia international Tim Cahill was among Thompson's favourite players while growing up and he still describes Harris, who scored 138 goals in two separate spells with the club, as "a legend". Thompson added: "He still takes part in training sometimes and he can put the ball in the top corner from 20 yards. You think 'he's still got it'. "It's great to have him as manager. He has been a massive help to me. He has been there every step of the way and he gives me a lot of guidance. "Watching players like the manager and Tim Cahill growing up and then going on to play for the club I support is a massive achievement." The season could end on a high for Thompson and Millwall, with the Lions facing Bradford in the semi-finals of the play-offs. They travel to Yorkshire for the first leg on Sunday before the return at The Den on Friday. "I have been quite comfortable and the team have not been too nervous," Thompson said. "The more senior players have experienced it before so I just need to go into it and keep focus." Harris added: "Ben will want to drive us on to promotion this year and ply his trade in the Championship next year. "He has done extremely well at this level over a period of games. We won't be getting carried away but he has a bright future." Interviews by BBC Radio London's Murray Burnell.